The ‘Teslasuit,’ a wireless suit created by a UK based company, claims that their invention can allow users to feel sensations in the virtual world. If the prototype is brought to the market, it could revolutionize the world of entertainment. Ultimately, the device works by using integrated EMS (Electro Muscular Stimulation). The range can vary—from a gentle breeze to the impact of a speeding bullet…the latter may not sound like a terribly enjoyable experience, but of course, it is simulating the sensation (not giving you the full on experience). The team hopes that combining EMS with VR will deliver a more interactive experience for users. Technically speaking, the Teslasuit is a series of sensors that allow the user to feel the sensation of movements in the virtual reality space. Different wearable accessories, called modules, are available separately. 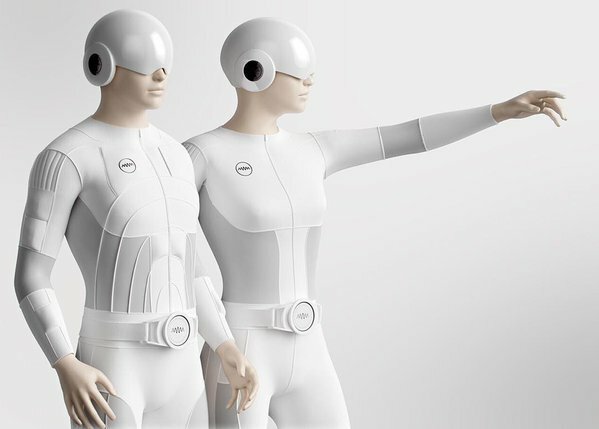 The modules include the T-Belt, the T-Glove, and a jumpsuit known as the “Smart Textile.” However, when added together, they function like a suit. To date, VR headsets focus on delivering a visual experience; what’s largely missing is feedback from the virtual world that translates the VR experience into tactile sensation. That’s where the Teslasuit comes in, by stimulating the muscles in response to whatever action was taken, or stimuli was provided from the virtual environment, individuals and see and touch another world. The suit is powered by Quad Core 1GHz processor and 1GB RAM with a 10000 mAh battery that runs on a proprietary OS, called Tesla OS. You can see a video of reports and experts in the field testing the tech below (click on the YouTube button to see more test videos). Using EMS fed to the body’s nervous system via a skintight suit, the latest prototype can simulate a of a sense of touch or pressure. Meaning that, if someone in the virtual world taps you or pokes you, you will feel it in real time. Recently, the technology was demonstrated in a TV documentary where the subject was able to ‘feel’ a hug from a motion captured demonstrator across the room. In addition to its EMS feedback, the suit is also equipped with temperature controls that allows it to simulate temperature changes in order to mimic the environment in VR more accurately. It is also capable of capturing the user’s body motion once the Mocap unit is fitted into the technology. The team behind the device claims that the system will be compatible with all available VR headsets. And you can preorder one now on the company website. But it will set you back a cool $1,499.